Red chilli pesto made with sundried tomatoes, red peppers, cheeses, paprika and chilli. 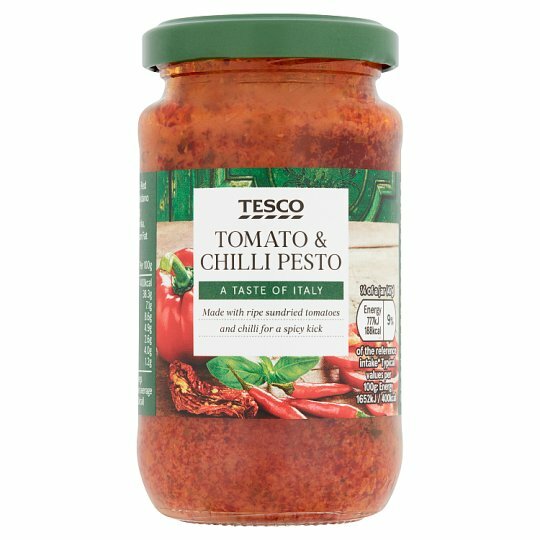 INGREDIENTS: Sunflower Oil, Water, Tomato Purée, Red Pepper (5%), Grana Padano Cheese (5%), Sundried Tomatoes (4.5%), Basil, Paprika, Sugar, Dried Red Pepper, Pecorino Romano (Milk), Cashew Nuts, Acidity Regulator (Lactic Acid), Chilli Powder, Salt, Pine Nuts, Garlic Powder, Sea Salt. Grana Padano Cheese contains: Grana Padano Cheese (Milk), Preservative (Egg Lysozyme). May contain peanuts and other nuts.For allergens, see ingredients in bold. Store in a cool dry place. Once opened, keep refrigerated and consume within 2 weeks.